Enjoy it while you can. Believe it or not Britain’s roads have been getting quieter over the past few years, not least because of the economic downturn. The volume of traffic peaked at 314 billion vehicle miles per annum in 2007 and has since slid to 303 billion miles (2010 figure) – the lowest level since 2003. 2) Despite the increase in traffic, CO2 emissions are set to decline by 9% from 2010 levels because of improvements in the fuel efficiency of the car fleet and the use of biofuels. 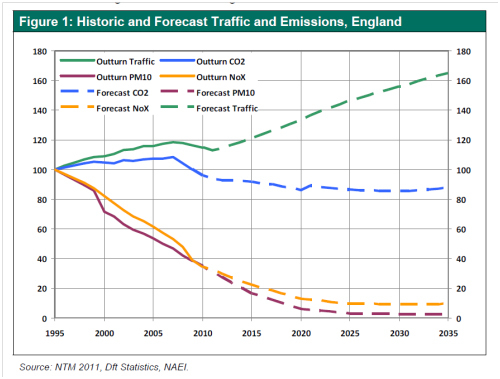 The DfT also looked at high and low travel demand scenarios. Under the former traffic could increase by as much as 55% by 2035, while even in the latter case the number of miles travelled would go up by 34%. Much of the projected growth in traffic can be put down to population growth (though the demographic profile of the population is also important – older people tend not to drive as much as younger people). However the forecast dismisses the notion that individuals have reached a limit in their demand to travel by car. It foresees a time post-recession when car demand per person will again rise at around 1.2% per annum between 2015 and 2025 (a rate similar to the 1990s) and for the ten years after the growth will still be positive but will fall to an annual average of 0.5%. In the confines of Whitehall, therefore, the notion that we have reached ‘peak car’ is fanciful.